It is not always easy to enter some of these villas ‘Japanese-style’ – that is, walking in without a reservation and taking lots of pictures. Many are even closed to the public entirely and only open for seasonal business conventions and other pre-arranged gatherings. Some also have strange hours of operation and are closed on certain days of the week. But if you have the passion like we do for exploring Italy villas, nothing can stop you! This online guide offers suggestions and tips so you won’t have to arrive into closed gates when you come to marvel at some of these villas Lake Como’s hidden gems. This one is our all-time favorite out of all the villas Lake Como hosts and is a must-see for all tourists. Nestled in between Cadenabbia and Tremezzo, from the villa’s terrace, you can catch a wonderful glimpse of one of the most beautiful panoramas of Lake Como with a view on Bellagio, Bellano and Varenna. The villa is open to the public from April until September from 9am to 6pm. It is also open in March and October but limited in its hours – from 9am to 4:30 pm with a break in between 12pm to 2pm. It is closed November through February. Adult admission costs 7.50 euros per person. The best time to visit is in May when the colorful azaleas are in full bloom and be sure to reserve a couple of hours if you want to see the botanical garden outside in its entirety. I mean it…the park is huge! 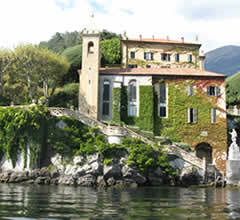 Villa Balbianello is one of the most striking villas Lake Como owns. It cascades down the mountains into the lake?s shore. It was here that one of the recent Star Wars episodes was filmed, as well another movie entitled A Month on the Lake with Vanessa Redgrave and Uma Thurman. Many Americans also wish to visit us after Casino Royale with the new James Bond 007 was filmed here. The interiors exhibit details on the extraordinary lifestyle of one of Italy’s richest men and last owners of the villa – Guido Monzoni. This villa is one of the most famous of all villas in Lake Como Italy. A hotel since 1873, it is rated 5 stars and you’ll immediately recognize why after paying an average of 1000 euros a night! Service is top-class. Everyone from the concierge to the sporting club staff will treat you like royalty. And they better, because with some careful people-watching you may notice some of your favorite celebrities staying here. The historical paintings that don the hallways of this Villa are enough to take a day to observe, and the old tapestries, ceiling frescos and woodwork are absolutely stunning. In order to preserve the privacy of its guests, the guards don’t allow tourists to enter. However, you can call to arrange for them to give you a private tour of the gardens between April and October. The phone number is +39 031 3481. Anyone taking a boat ride through the central part of Lake Como will notice the angelic, white Villa Melzi right next to the town of Bellagio.Its beautiful neo-classical facade has inspired many important 19th century writers such as Stendhal, Liszt, and Foscolo. The lovely Villa Melzi garden was the first English-style garden in Lake Como with grassy hills, various species of trees, a Japanese bridge, a Moorish pavilion, and a monument to Dante and Beatrice by Comolli thought to have inspired Franz Liszt (a frequent guest) to compose his sonata, ?To Dante?. Although the interiors of the villa are closed the garden are open from 9am to 6:30pm – April to November for a cost of about 6 euros. This beautiful villa is not to be confused with the Grand Hotel Villa Serbelloni in Bellagio, a 5 star hotel located right on the lake. It lies on the other side of Bellagio’s peninsula and occupies 18km of paths through splendid gardens that extend all the way to the peak of Bellagio’s cape. It is not possible to visit the interiors of the villa, now owned by the Rockefeller Foundation in New York. But apparently we’ve been told you wouldn’t want to anyway, as it is very empty aside from some comfy furniture. 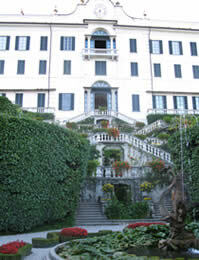 There is a very knowledgeable lady who gives guided tours of Villa Serbelloni?s park lasting about 1 hour 30 minutes. Tours are available April to beginning of November and do not operate on Mondays. leaving at 11 am and 3.30 pm from the medieval tower in the St. Giacomo square in the upper part of the town. You need to call in advance +39-031951555. These villas have lovely terraced gardens with absolutely heavenly views of Lake Como. They are noted for their beauty and wide selection of a rarity of plants which survive thanks to Lake Como’s mild climate. Scattered all throughout the gardens are fine sculptures. For only 4 euros you can have access to both gardens. As with most tourist attractions including villas, Lake Como seems to ‘close down’ between November and April. So remember that the gardens are open to the public from March to October – 9am to 6pm.